I received my Popsugar Must Have June box this week and I was so excited to see what was inside, because I hadn't looked at spoilers. It's always fun opening this box when I have no idea what is inside! Popsugar Must Have always includes an information card explaining everything in the box. This month's inspirations were Sunshine, Cheers, Joy, Togetherness, Outdoors, and Festivities. Sounds like a good box to me! There was one spoiler for this month's box. It was the Hat Attack Neutral Diamonds-Printed Sarong. Retail price $58. I like getting these type of items in subscription boxes. This one will go with lots and is really pretty and soft. The pattern reminds me of an old faded bandana and I love it! In the email Popsugar provided a few ways to wear it. 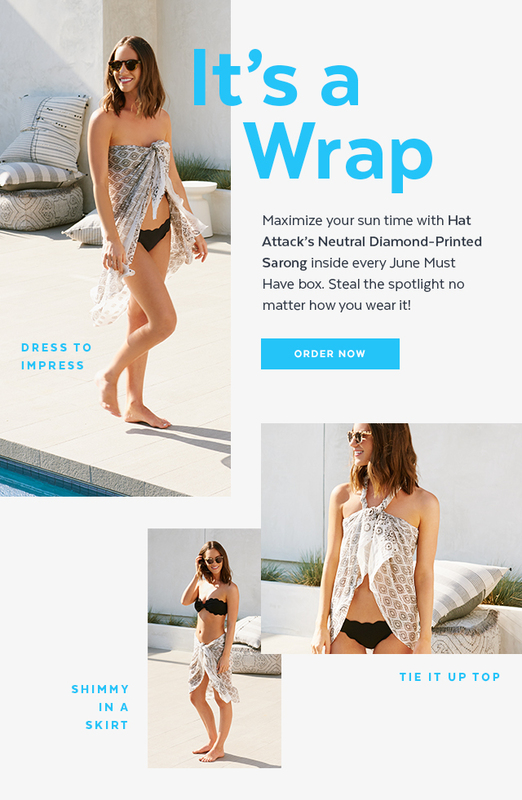 I love the idea of wearing it as a beach top! So pretty! The next item in the box was Sisters of Los Angeles "Cheers" Gold Bottle Opener. Retail price $12. I actually really like this! It's simple, but makes a statement and is a nice weight. It will be great for entertaining! And it's something you always need, so I think this was a great addition to the box. My favorite item in the box was Wild and Wolf Ridley's Games Room "Who Am I?" Quiz. Retail price $12.95. This is a fun game with cards that you guess the celebrity. I probably won't do well at it, but it's a great game for entertaining. I can't wait to have a party! I love having fun and unique items like this laying around. And I don't have anything like this yet, so I'm really happy with it. The next item included was NCLA Born on the 4th Nail Lacquer. Retail price $16. I love the 4th of July! I love fireworks! I love the colors, so of course I also love this polish. This has red, white, and blue glitter flakes and will be so fun on my nails! This was exclusively created for Popsugar!!! We have a trip planned for the 4th of July, so it seems fitting to paint my nails and my daughter's nails with this polish. So cute! I also received Knock Knock Are You Ready (For Your Close-Up?) Compact. Retail price $10. I needed a new compact mirror, and I like the simple look of this one! Plus the cheeky words are too cute! The information card says don't worry about sand messing up this compact mirror, it's durable enough to throw in your beach bag. I'll have to test that out. It is a real nice mirror. My old one was real thin and this just feels nicer, plus it looks better!!! The next item was Pacifica Underarm Deodorant Wipes. Retail price $9. These will come in handy for sweaty, hot, humid days. I'll be tossing these in my bag to freshen up. Plus the packaging looks nice and you can't even tell what they are, unless you read it! The final snack item included this month was Pressels Sriracha. Retail price $1.29. My dad loves Sriracha and with Father's Day this weekend, I'll be adding this treat to his gift. I'm sure he'll love them! I really liked the June Popsugar Must Have box! I will use all the items, which always makes it a good box. I tried to stop subscribing to Popsugar, but was scared about what I might miss out on. Then they offered a good deal last month and I re-subscribed for 6 months. I guess I won't be quitting Popsugar anytime soon. I'm happy with my decision and can't wait to see what's in the July box!